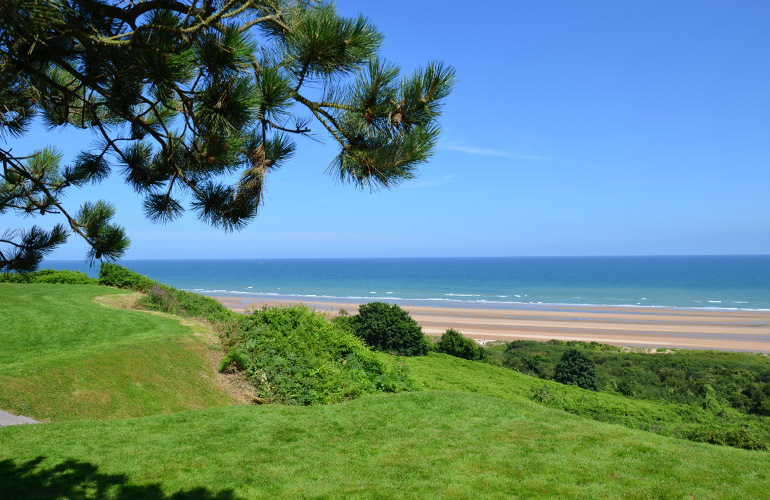 View today of Omaha Beach from the U.S. Cemetery at Colleville-sur-Mer in Normandy. My husband and I are seasoned travelers and would like to take a trip to see some of Europe’s important World War II sights, including Normandy, the Ardennes, Amsterdam, Munich, and Nuremberg—and we’re open to other suggestions. We want very knowledgable guides in each place and want to stay in the nicest accommodations. 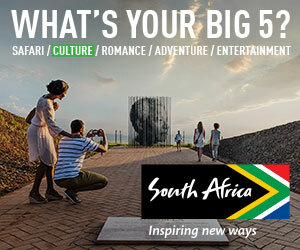 Who should we contact to help us plan such a trip? With the 70th Anniversary of D-Day coming up this Friday, there’s a lot of interest right now in European itineraries that encompass the Normandy landing beaches and other WWII sites. Randy, this means you need a Western Europe travel specialist with knowledge of, and access to, the best guides for these sites. My suggestion is that you reach out to Rudi Steele of Rudi Steele Travel. He’s a particularly well-connected travel agent who was born in Germany (where his older brothers were actually drafted into the Hitler Youth) and raised in Switzerland. World War II is a passion for him. Over the years, he has made private guided WWII itineraries a subspecialty, and he also has close relationships with the general managers of Europe’s finest hotels, and that translates into preferred treatment and extra benefits for you. Rudi is imaginative with itineraries, so fasten your seatbelt. He may suggest that you start off in London at the Imperial War Museum. It’s currently closed for renovation, but just last week he got some travelers inside it privately with a historian. Rudi can even fly you by helicopter from London to one of the Landing Beaches in Normandy! As you move through France toward Germany, he might recommend you make time for some of the underground fortresses along the Maginot Line. As for Germany, the court room in Nuremberg is a must, of course, but Rudi says a highlight for World War II buffs is a visit to Colditz Castle, near Leipzig. The Germans used the Castle as a high-security prison for Allied officers who were considered particularly dangerous and had escaped from other prisoner-of-war camps; many managed to break out of the Castle anyway, and you can tour the escape tunnels. Randy, over the next few days the beaches of Normandy (like the one pictured above) will be bustling with 70th anniversary activity. By the time of your trip, though, all should be back to normal and peaceful. Have a great trip! Thank you so much for recommending Rudi Steele for our World War II trip. It was the best trip! He arranged absolutely everything. The pace of the trip was flawless. We were even able to get into some sights that are not open to the public and we had upgrades at virtually every hotel. Whenever there was a minor glitch while we were traveling, he was on top of it instantly. I can’t thank you enough for that recommendation. My son and I recently toured Normandy’s WWII sites with Duncan Hollands who is extremely knowledgeable and interesting. We spent three days with Duncan and were privileged to visit some very interesting out of the way sites. Goggle Duncan Hollands for contact, or consult trip advisor. I also took a tour with Viator Tours: http://www.pointsandtravel.com/remembering-d-day-june-1944-70-years-ago-normandy-france/ that was fabulous. It is a bus tour from Paris. Remove if you don’t want a link, no problem. Berlin – Topography of Terror – basically a timeline of Nazi Germany. So interesting and compelling. Berlin – Otto Weidt Museum – the Schindler of Berlin. He gave jobs to blind Jews to save them from the camps. Tiny museum, but definitely worthwhile. Krakow – Auschwitz – I’ve been three times and keep telling myself never again, but I keep going back. I think it’s on of those disturbing and terrible reminders of what happened that is essential to experience. Krakow – Schindler Museum – the Poles really know how to do museums and this one is no exception. The old Oskar Schindler factory is now a museum of the history of Krakow from 1939 – 1945. A must-see. Warsaw – Warsaw Zoo – crazy, but the story here is amazing, as anyone who has read The Zookeeper’s Wife knows. It’s a story of bravery and strength during a time of unbearable hardship. Warsaw – Museum of the Warsaw Uprising – again, a story of how people banded together to resist the Nazis. Even though it was ultimately unsuccessful, it’s so important for this generation to know what is possible when people come together.